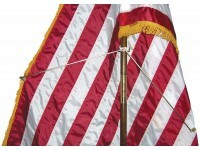 Complete Deluxe Sets Include:Flags: 1 each, Army, Marines, Navy, Air Force, Coast Guard Endura-Nylon™ SolarMax Military Flag with lined pole hem, leather mounting tabs & .. 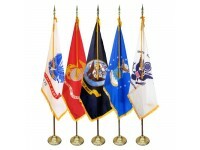 Complete Deluxe Sets Include:Flag: (your choice of Military Branch or POW-MIA)Endura-Nylon™ SolarMax Military Flag with lined pole hem, leather mounting tabs & luxurious golden rayon/bul.. 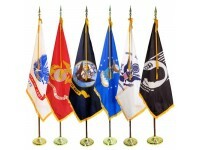 Complete Deluxe Sets Include:Flag: (your choice of Military Branch or POW-MIA) Endura-Nylon™ SolarMax Military Flag with lined pole hem, leather mounting tabs & luxurious.. Complete Deluxe Sets Include:Flag: (your choice of Military Branch or POW-MIA) Endura-Nylon™ SolarMax Military Flag with lined pole hem, leather mounting tabs & luxurious golde.. 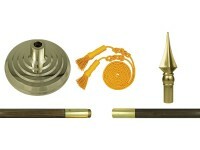 Complete Budget Sets Include:Flags: 1 each, Army, Marines, Navy, Air Force, Coast Guard Endura-Nylon™ SolarMax Military Flag with lined pole hem, leather mounting tabs..
Set Includes:8' x 1-1/4in Oak pole with precision machined brass screw joint12in Diameter shiny gold plated plastic Regent floor standGold cord & tasselShiny gold plated ABS polystyrene spear..